Parrots use tools although there are very few reports of spontaneous tool use in captive birds. 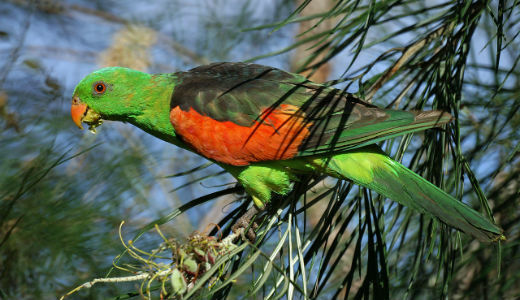 Some parrots have been observed using objects such as feathers to scratch themselves in hard-to-reach places. Researchers studied tool use in six captive hyacinth macaws while feeding. They found differences in nut manipulation and opening proficiency between adults and juveniles. The birds used materials as a wedge, preventing the nut from slipping and/or rotating, reducing the impact of opening, or providing mechanical aid in its positioning and/or use of force. The scientists believe that birds of this species may have an innate tendency to use objects as tools to aid nut manipulation and opening.